Roughly one in seven Americans are age 65 and older, and the number of elderly is projected to grow to an estimated 72 million, or one in five Americans, by 2030. In the 2008 National Study of the Changing Workforce, 42% percent of employees said they had provided eldercare within the last 5 years. Over 40% of those workers also had a child in their home. Unlike childcare, eldercare responsibilities generally increase over time as the person cared for ages, and eldercare tends to be less predictable than childcare. A recent study suggests that caregivers age 50 and older who leave the workforce to care for a parent lose, on average, nearly $304,000 in wages and benefits over their lifetime. Workers who think they have been discriminated against because of eldercare responsibilities should make sure their understanding of the circumstances is accurate. Keep notes about statements and actions that you believe are discriminatory. How other people like you have been treated is usually very important, so ask around. Talk with your supervisor, if appropriate, and tell him or her that it appears that you have been discriminated against. If your company has a grievance procedure, use it. The law does not allow your supervisor to retaliate against you for making a complaint. If the situation is not resolved, contact a local attorney or contact us to get an objective view on whether you have been discriminated against. If you decide to pursue legal action, you must file a complaint with an EEOC office or a local EEO office, and you may have as few as 180 days within which to file. To get more information about filing a complaint, visit www.eeoc.gov or call the EEOC at 1-800-669-4000. Employers should take steps to prevent FRD, as they are often caught off guard by lawsuits caused by actions they may not have known were illegal. A good place to start is reviewing your hiring, attendance, promotion, incentive pay, benefits, and leave policies to ensure that they do not negatively impact employees with family caregiving responsibilities. 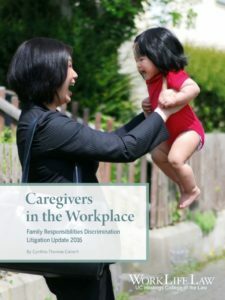 Adding “family responsibilities” as a category to your nondiscrimination policy is also a good idea; a free model policy is available from the Center for WorkLife Law. Training supervisors and HR personnel about what constitutes family responsibilities discrimination and how to handle complaints is essential. They need to understand the common stereotyped assumptions about family caregivers as employees, and the common fact patterns that give rise to liability. Finally, treat all complaints of FRD seriously and ensure that all supervisors know not to retaliate against employees who have made complaints. Employers may also contact WorkLife Law for further details regarding FRD prevention. Copyright © 2019 The Center for WorkLife Law. All rights reserved.